The origins of the Monte Sano Club are described in an early brochure that was published to promote the sale of memberships. The first swimmer broke the sparkling waters of the Lowell M. Anderson Swimming Pool June 24, 1962. But the real beginning of the Monte Sano Club reaches further into history than that. 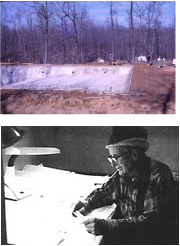 Early in 1960 the Monte Sano Civic Association commissioned a committee to search for a likely site for a community recreation center, to be fashioned around a pool as a beginning nucleus. The search paid off with 80 acres along the north slope of the mountain--since supplemented by 20 adjoining acres--and it was time to begin work in earnest.The Civic Association's role in the operation was that of prime mover. Once the project had taken direction the Association stepped out. And that's when the Monte Sano Club was born. During its building stages the club was led by Colonel Lars Balck. At the organizational meeting held in March 1961 Dr. William Cameron was named first president of the group, and 57 charter members were signed up. Things were under way. A nationally known architect was commissioned to plan the project. Responsibility for construction was turned over to an engineer with experience in bridges, dams, and major government projects all over the hemisphere. Acres of detail drawings for the intricate hydraulic and electrical systems that form the sinewy concrete crater were produced by a top-notch draftsman. Volunteer labor was recruited from skilled--and unskilled--residents of the mountain and put under the supervision of a critical foreman. Work went on many nights until past midnight, through raw winter winds and blistering summer sun, weekdays and weekends. Finally, one year to the day after the first bulldozer appeared on the site, the first swimmer broke the pool's sparkling waters. A note on the pool's name: The Civic Association's one-man committee to select the site was named Lowell M. Anderson. So was the volunteer architect. So was the volunteer engineer. So was the volunteer draftsman. So was the volunteer foreman. So is our pool.